After a respected citizen dies, a city begins to unravel. 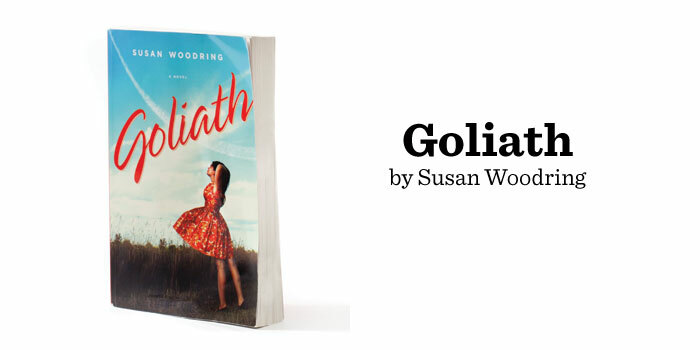 When well-respected furniture mogul Percy Harding jumps in front of a train, the residents of his small North Carolina town, Goliath, are thrown into grief. Several are unable to recover from the trauma, including Percy’s longtime secretary, Rosamond. The catastrophe sets off a series of losses — more deaths, reduced hours at the furniture factory, disruptive behavior among the town’s youth. It becomes clear that Percy’s death was not so much an instigator of the loss as a cog in the machine of the town’s self-destruction, which was itself set into motion long before. Author Susan Woodring takes her time with this tale, building each sentence as carefully as a master craftsperson. As a result, Goliath is about many things — economics, suicide, labor issues, tradition, community, marriage, organized religion, parenthood, spirituality. But most of all, it is a novel about the colossal losses of love and life, as well as the more minute, banal losses of the everyday, which, piled up on themselves, inevitably become colossal. The work’s central question revolves around the issue of surmounting obstacles. If, as Rosamond observes, loss is “nothing more than the other side of love,” how does one cross back to the other side? The answer is personal and complex, but with her melodic prose and intense examination, Woodring does the story full justice. St. Martin’s Press. 2012, 368 pages, hardback, $24.99.